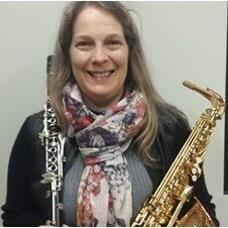 Interested in taking lessons with Tammy E.
Tammy Enevold is a clarinet and saxophone instructor with close to 15 years of teaching experience. In addition to her private studio, she has taught at Lawrence University, University of Kentucky, Asbury College, and Wisconsin Lutheran College. She holds a B.M. in Clarinet Pedagogy from Lawrence University, a M.M. in Music Performance-Clarinet from the University of Kentucky-Lexington, and a Ph-D in Musicology from the University of Kentucky. She has also studied in London with Pamela Weston, and in Stockholm with Kjell-Inge Stevenson. Request Lessons with Tammy E. today!